Comfort and Support are two key elements to define a high-quality saddle, which now are achievable through Particle Flow Technology. This year, Giant apply new High-Elastic, free-flowing particles inserted into two separate pockets that mold to each rider’s unique pelvic contact condition to provide superior pressure relief and support. The result, tailor-made comfort for greater performance. A tailor-made feel is now achievable through Particle Flow Technology, which are free-flowing particles inserted into two separate pockets within the saddle structure. The particles mold to the rider’s unique pelvic contact condition, reducing pressure points by more than 20 percent and help distribute pressure across a broader contact area. The result is greater performance through superior comfort and support. 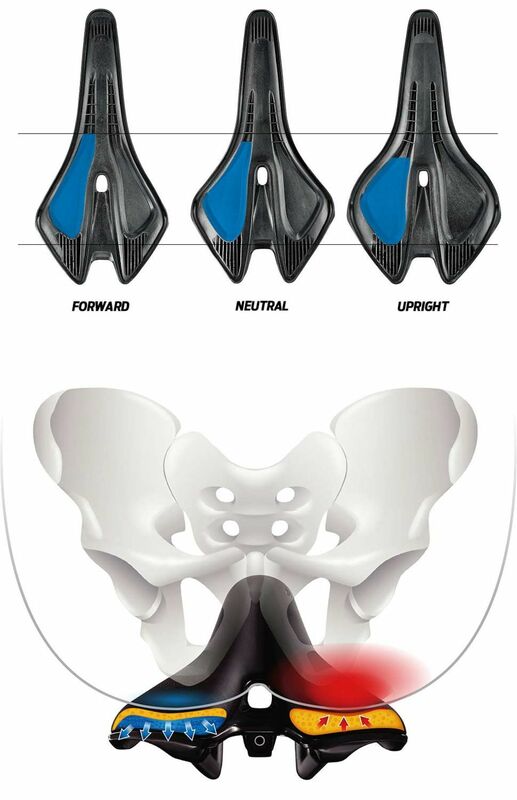 Contact series saddles feature 3 different particle flow pockets that are based on the rider’s pelvic contact condition. The particle flow pockets correspond to the rider’s pelvic contact areas to provide optimal comfort and a tailor-made fit and support. The free-flowing particles allow the load on the foam to disperse. This allows the contact areas to conform uniquely to the rider’s body and reduce the pressure points that cause pain,discomfort. Tradition foam can only flex a certain amount. This reduces the contact area with the rider and increases the focused area of pressure.